To mark this momentous occasion, �Royal Flora Ratchaphruek� is one of the grand celebrations being hosted by the Royal Thai Government in honor of His Majesty King Bhumibol Adulyadej (Rama IX), the ninth ruler of the illustrious Chakri Dynasty and the world�s longest reigning monarch. His Majesty is �Father of the Nation� and �Beloved King� to the Thai people. Royal Flora Ratchaphruek 2006 represents a concerted effort of the Thai people to create one of the world�s most beautiful international horticultural expositions as an expression of deep love and respect for their Beloved King who has won the hearts of Thai people across the Kingdom through His Majesty�s tireless dedication to bringing about a better quality of life of for the Thai people through His Majesty�s gifts in agricultural projects as well as valuable lessons in life. Thailand will be joined by her international friends -- nations with whom Thailand has shared history, cultural, diplomatic and trade ties, many spanning the centuries. Over 30 countries are expected to participate in �Gardens for the King�. The International Gardens will feature unique or innovative landscaping and horticultural highlights from the participant�s homeland. 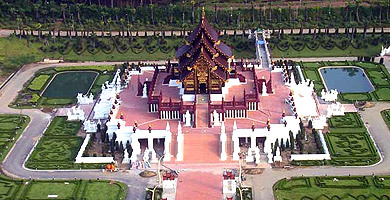 The expo site is situated on 80 hectares of land at the Royal Agricultural Research Center in Mae Hia sub-district, Muang district, Chiang Mai Province in Northern Thailand. Set amidst the lush landscape of the surrounding mountains, the location provides a picture-perfect setting for Royal Flora Ratchaphruek 2006. A one-of-a-kind event, Royal Flora Ratchaphruek 2006 is being organized to present to the world the marvels of plants and breeds of over 2,200 species of tropical plants and flowers. 2,500,000 plants in total will be enriching the land and the minds of onlookers.